Sears sold the Oak Park model from 1926 to 1933. This Oak Park in Barrington looks very much like the catalog illustration. The house appears to have the original 8- and 10-over-1 windows. It is missing the sun room and today has aluminum siding rather than wood siding. "See the beautiful colonial entrance with its sidelights and fan over the door, hood and columns, and the brick porch!" exclaimed the Modern Homes catalog. 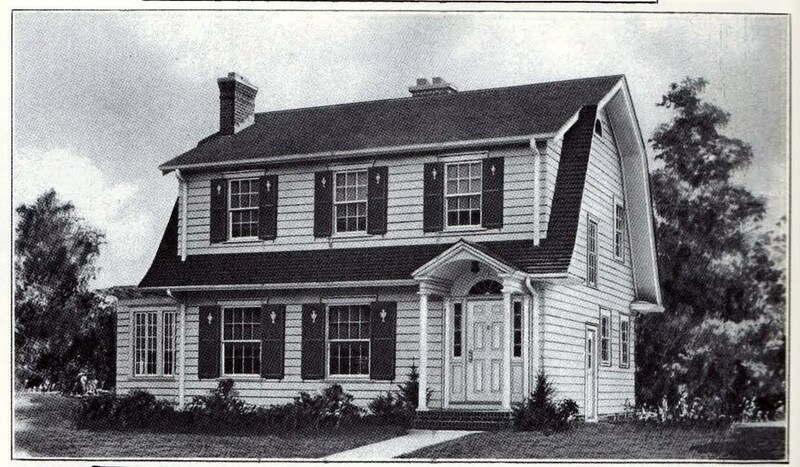 The same Colonial entrance, as illustrated in the 1929 Sears building materials catalog. The side pergola with a wood lattice trellis was an option on many Sears models. You could purchase this option in 1926 for about $80. There have only been three Sears Oak Park houses definitively identified to date. The difficulty lies in the fact that there are thousands of Dutch Colonial homes that look much like the Oak Park, and one of the only distinguishing features of the Oak Park is the gable roof entry porch. Unfortunately, that same porch was also sold by millwork companies other than Sears so even that can't be used as concrete evidence that a house is truly an Oak Park. Lucky for us, this Sears Oak Park in Barrington was authenticated via a testimonial letter from the original homeowner. That's a testimonial from the owner of the Oak Park in Barrington, featured in a 1928 brochure from Sears entitled "Air-Sealed Walls". Scan courtesy of Cindy Catanzaro. The Oak Park in Barrington was built in 1927. The original owners were Ethel Drover (the letter writer) and her husband, Percy. Percy owned a Chrysler-Plymouth dealership in Barrington called the Drover Motor Company. Not coincidentally, this dealership was located next to the Sears Modern Homes sales office in Barrington. The Drovers took out a mortgage for $15,000 from a local bank. "For the first five years of my life, we lived in an apartment above the dealership. Then we needed bigger quarters, and the family decided to build a Sears home at the edge of Barrington -- a house through the mail, so to speak." The Drovers lived in the house until the 1960's.